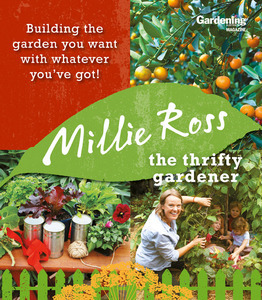 TALKING to Millie Ross, the original thrifty gardener is like chatting over the fence with an old friend. The popular ABC TV Gardening Australia senior researcher is at once charming, refreshing and knowledgeable, without making you feel silly for not knowing the difference between a geranium and a pelargonium. You feel that if you invited her around for afternoon, she’d show up with a home baked cake, help weed the herb patch, make you a charming planted garden seat and stay to help with the washing up. Her effervescent personality shines through in her new book THE THRIFTY GARDENER which is chock-full of groovy, fun and stylish garden projects, Milli shows us how to grow edible cubby houses, make a terrarium, build a self-watering pot to ponds and fire pits, all made from repurposed materials, pre-loved and recycled materials. She says with this book she wanted to make gardening accessible to everyone. Mill reckons we should embrace life and just get out there and grow. Subtitled Building the garden you want with whatever you’ve got, thrift is the book’s underlying theme. Milli loves scavenging and uses the most mundane items as containers – including a toaster she found on a scrap heap. “Everything in my garden has a story and everyone loves my toaster,” she says with a laugh. But Milli says people need to think about how they go about gardening. “People will spend hundreds of dollars on technological won’t last the year but baulk at spending $5 on a plant that won’t work in their garden,” she says. So Milli offers clear and easy-to-follow instructions on designing and building everything from practical yet picturesque chook runs to selecting seeds, propagating and planting. Renters are well catered for, as Milli herself has been dragging pots around Melbourne for a decade. And she knows the Geelong region as her parents live in the area. “I encourage everyone to have a crack at gardening,” she says.